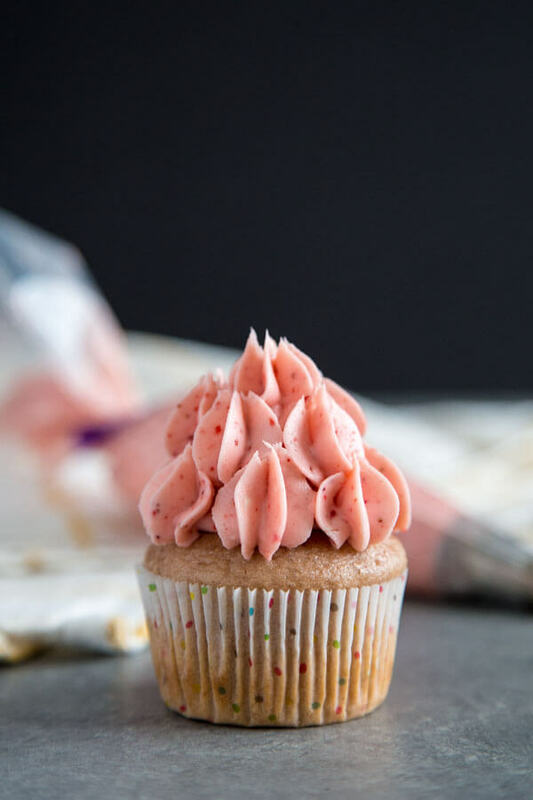 This pretty in pink Strawberry Cream Cheese Frosting is creamy, tangy and delicious, with absolutely no added food coloring. You’ll want to add it to every cake, cupcake, cookie, and anything you can add frosting to, trust me. My very first time making cream cheese frosting was for a red velvet cupcake recipe way before my blogging day. Since then, cream cheese frosting has held a special place in my heart. And also because it’s absolutely freaken delicious. 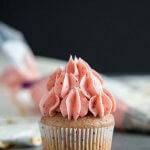 This particular strawberry cream cheese frosting is enhanced with a very special ingredient – freeze dried strawberry! You won’t get the perfect pink and the powerful strawberry flavor and tang with anything else. Freeze dried strawberry is not hard to come by. I buy mine at Target. 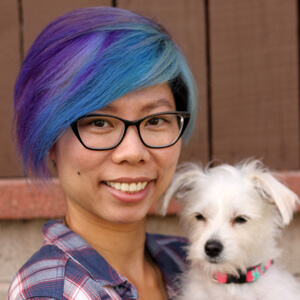 You can also get strawberry freeze-dried powder online, which will save you a step. With the sliced freeze dried strawberry, you’ll need to pulverize it into a powder using a food processor or a good blender. I usually drape a kitchen towel over the food processor so the powder doesn’t puff up everywhere. Once done, let it settle for a bit before opening the lid. Be sure to let the cream cheese and butter come to room temperature before hand. You can help it along by cutting it up into smaller cubes. 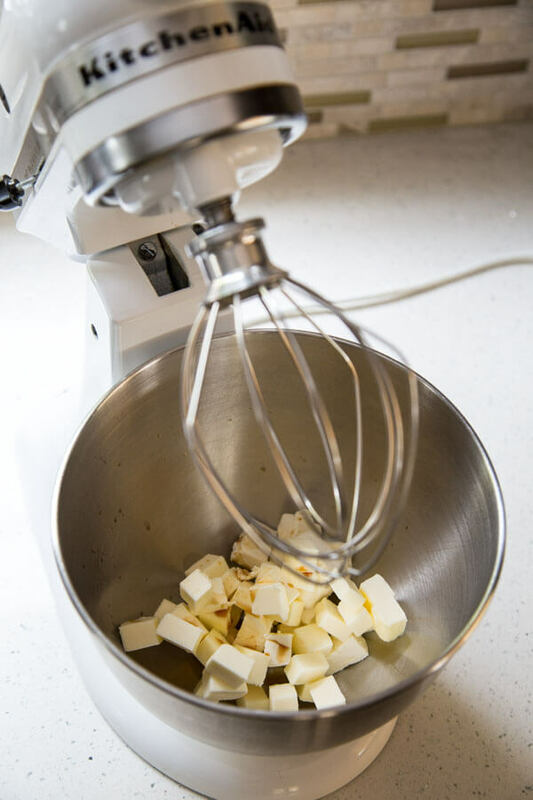 Add a splash of vanilla to the butter and cream cheese and beat to combine. I always use full fat cream cheese for the best result and taste. Once the butter and cream cheese are combined and creamy, it’s time to add powder sugar and strawberry powder. Mix it on low speed first to incorporate the powder mixture into the cream mixture without beating it all over the place. Then increase speed and beat it until all ingredients are thoroughly combined to yield a fluffy strawberry frosting. Note that I also tried making a strawberry frosting using strawberry preserve, but the flavor wasn’t strong enough. I would have to add a lot more preserve, but the frosting would start to get runny. 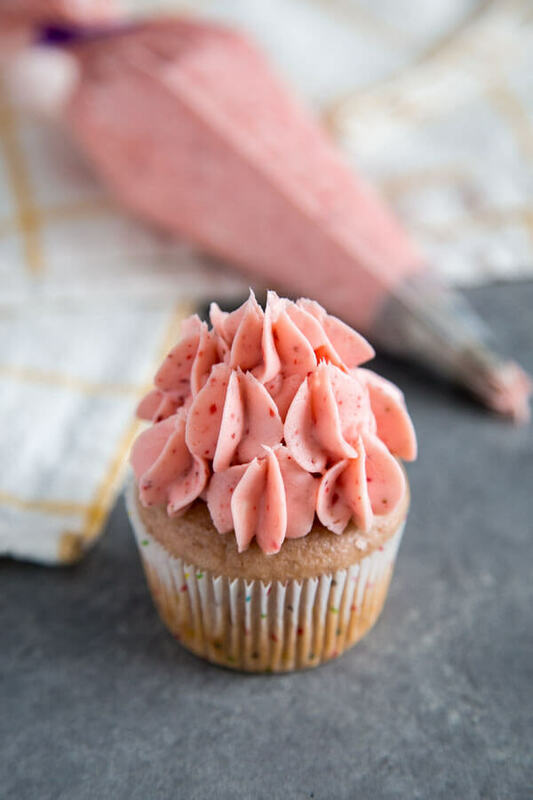 Freeze dried strawberry is the best way to get that concentrated flavor in your frosting without compromising the texture. 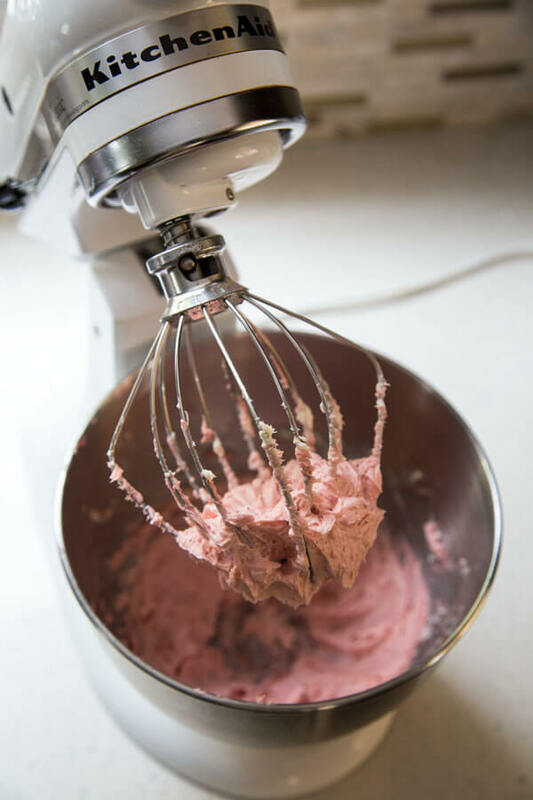 I’ve made this Strawberry Cream Cheese Frosting a few times over the years. I even added Champagne to it once on these Strawberry Champagne Cupcakes. I love it so much, I decide it needs its own post. Because truly, you can use in so many different ways. It will be perfect on classic vanilla cupcakes, better yet on lemon cupcakes, and don’t tell me you won’t put it on chocolate cupcakes. 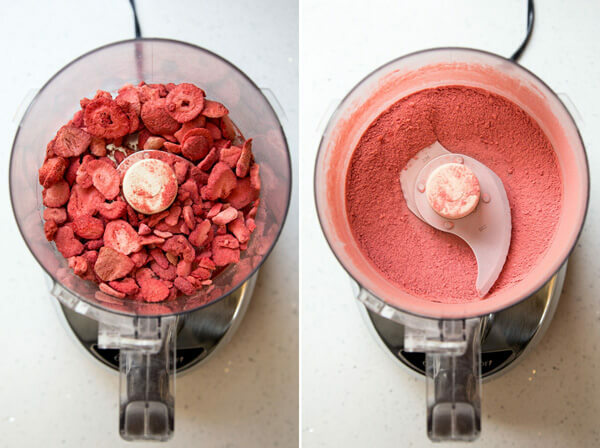 Add 1/2 oz of freeze dried strawberry to a food processor and process until a powder forms. Keep a kitchen towel draped over the food processor while it’s working to prevent the strawberry powder to escape and fly everywhere. 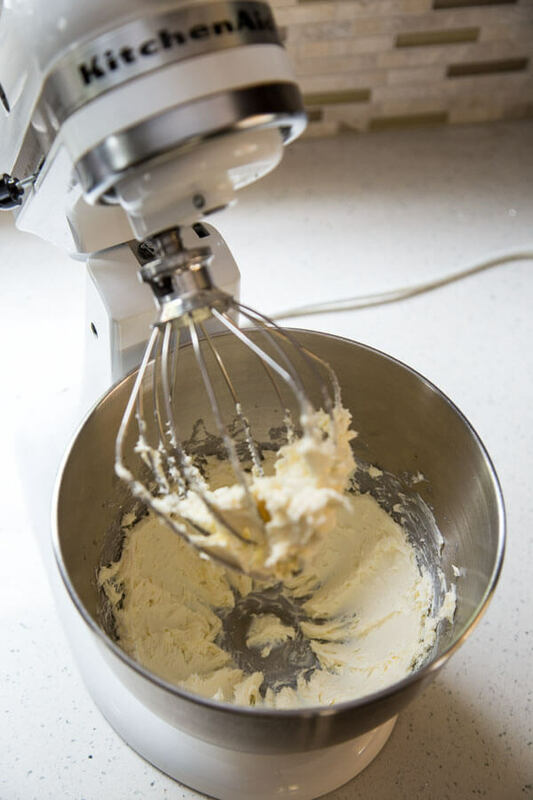 In the stand mixer bowl, add softened butter and cream cheese along with the pure vanilla extract, mix with the whisk attachment at medium low speed and gradually increase speed to medium high and beat until thoroughly combined. 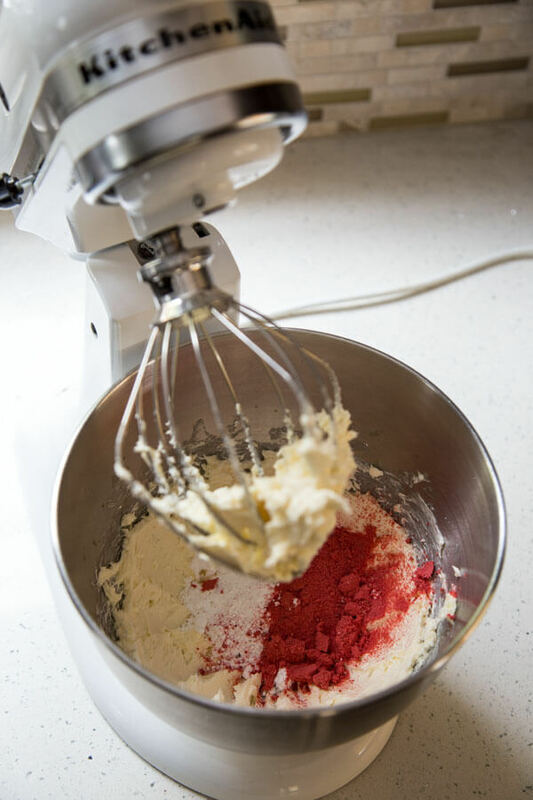 Stop the mixer to add powder sugar and strawberry powder, mix at low speed to incorporate the powder mixture into the cream mixture, then gradually increase speed to medium high and beat until thoroughly combined and fluffy. 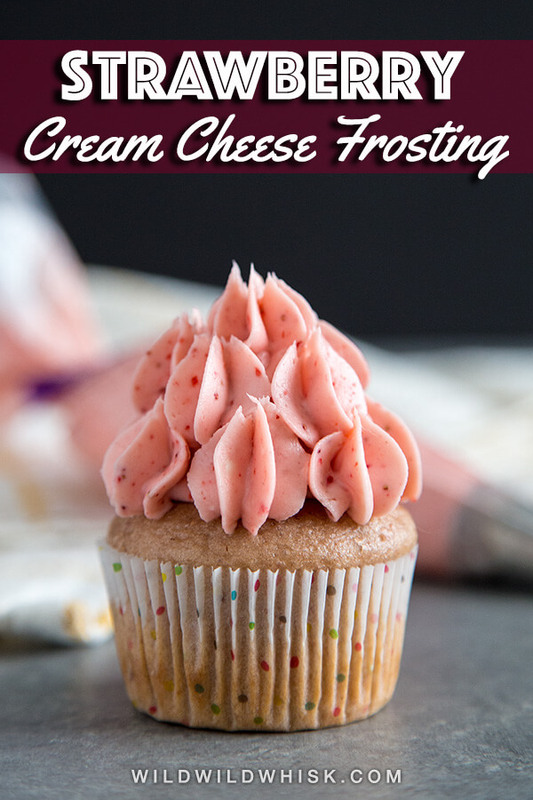 Use full fat cream cheese for best tasting frosting. Freeze dried strawberry can be found in the nut/dried fruit aisle at Target. I always buy the Simply Balanced brand. This recipe is enough to frost 12 - 15 cupcakes. Calories information is for 1 serving out of 15. I just made a fresh strawberry birthday cake for my sister and used this recipe. Absolutely delicious! I doubled the recipe to ice and decorate a two layer cake. It’s a warm, muggy day here so i added an additional cup of powdered sugar to tighten it up. 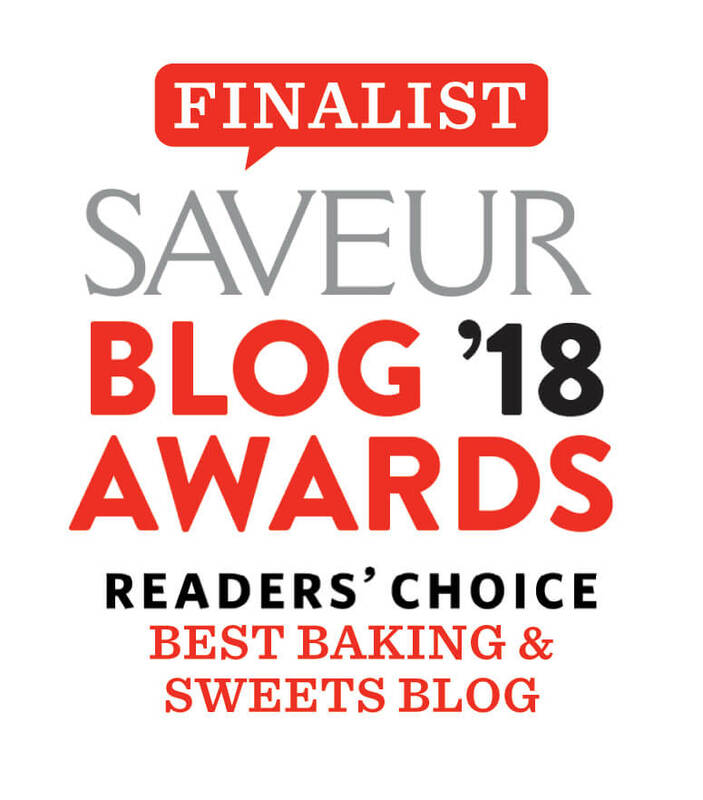 Wonderful taste and very easy to work with! I LOVE the texture and taste with the freeze dried strawberry!